Biker planet is a dedicated biker online dating community for biker men and biker women around the world. Irrespective of the type of bike you own and ride, be it a Suzuki, Harley, BMW, Honda, Kawasaki or Yamaha, biker planet is open to all and you will meet several other bikers who are waiting to meet with someone like you with a similar passion and interest like them. The site has a large member-base and runs both free and premium membership plans all with unique and interesting features for bike riders on its platform. Read our full review on Biker Planet to learn more about its special features. Registration is free on the site and it can be done with your Facebook account or directly from the site’s “sign-up” tab. When you click join, you will be asked to provide your username, password, email, birthday, city, choose your gender, and specify the gender you seek. After registration, you can move on to build your profile. Here you will be asked to provide detailed information about yourself and you can upload your photos too. When this is completed, you can go ahead to check through the list of other members, read their profile, check their photos, and send them flirts or messages. You will also be able to make specific searches on members and join others in chat rooms for discussions. The free membership plan allows you to upload your photos, make searches, and receive IMs. You need to subscribe to its membership plans to enjoy unlimited access to all its features. It does not have a mobile app for androids or iOS devices. There are no specific features specially aimed at bikers’ demand. Biker Planet is another top biker dating site for biker men and women that wants to meet and chat with bikers from other parts of the world. 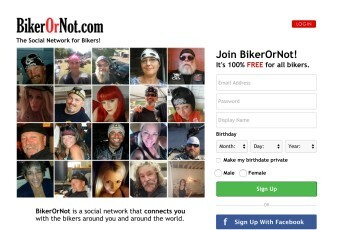 The site has a lot of registered biker men and biker women who are ready to meet, and chat with people who have passion for bikes or riders like them. Although you will need a subscription plan to use all the features, you can still register, build profile, upload photos, receive IMs and make searches for free. The site does not have a mobile app too but it is mobile-optimized and you can still enjoy its features without interruptions. If you are looking for like-minded biker singles online for a relationship or friendship, you should join this site. You can join and register a profile for free. You can use video chats, send and receive instant messages from members and you can use flirts. You can customize your profile and upload your photos. You can send and receive emails from members, join chat rooms and use the “rapid match”. You can report, block or remove members and you can add friends to your “little black book” or your “favorite” list. You can check through members’ profile and photos and you can make searches based on categories.